To learn more about the Mother Nature’s Diet healthy lifestyle and the Mother Nature’s Diet Community, please visit our main website here. This website you are on now is our extensive and popular blog site. Mother Nature’s Diet is a healthy lifestyle. It’s a way of living, including dietary guidelines, to help you have plenty of energy, avoid ill health and resist the signs of ageing as best as possible. Mother Nature’s Diet (or MND as followers like to call it) is designed to help you feel great, look your best and enjoy your life in every way. MND is a truly holistic healthy lifestyle, we look at the best way to eat and to live for good health and abundant energy, but we also connect human nutrition with the natural world, with Mother Nature and agriculture. We are interested in the best way to create a sustainable future, where we all eat for good health, but where we also improve animal welfare and topsoil management. Mother Nature’s Diet is all about taking personal responsibility, and working on yourself to get the best out of your life, in every way. There is certainly an element of personal development involved, this lifestyle is about being the best version of you that you can be. Whether you are currently aged 30 or 70, if you are the kind of person who refuses to accept that turning 40 means “it’s all downhill from here” and if you believe that we can be slim and healthy and full of energy in our 40s, 50s, 60s and beyond, then the Mother Nature’s Diet way of living might be the lifestyle you have been searching for. If you think the right way to live is to eat fresh whole foods, rather than searching for answers in the form of supplements, pills and powders, then Mother Nature’s Diet will resonate with you. If you want to lose that excess weight for good, no more fad diets, no more yo-yo weight loss, then Mother Nature’s Diet may be the answer you have been looking for. If you are prepared to get outside every day for some fresh air, take long walks at the weekends and switch off that TV from time to time, then you’ll feel right at home living the MND way. To inspire and help as many people as possible to find the best natural way to achieve supreme good health and abundant energy. Please be aware of and read our Medical Disclaimer and Terms and Conditions. What is Mother Nature’s Diet not? Mother Nature’s Diet is not a fad diet! We use the word diet in it’s correct meaning…not as a ‘temporary way of eating to lose some excess weight’! This is a long term lifestyle, not a quick fix fad! MND is not just a weight loss program, it’s not just a quest for a 6-pack and it’s not a ‘muscle building program’. MND is not a sports nutrition plan, to help you lift heavier, cycle faster or run for greater distances, however, it will help you to be healthy on the inside, which should aid you in whatever sports or exercise goals you pursue. MND is designed to help you be the best, healthiest version of you possible, healthy on the inside, looking good from the outside, to help you achieve whatever life goals you have. MND is about living longer – we want to add years to your life, and life to your years. Mother Nature’s Diet is made up of 12 Core Principles, a simple set of guidelines about how to live, eat and move your body. These are 12 simple points to guide you to optimal good health. The 12 Core Principles are easy to understand, easy to implement in your life and easy to follow. To learn more about the 12 Core Principles in detail, please go to this page. You can find out how other people are getting on, living by the 12 Core Principles of Mother Nature’s Diet, by clicking here to read their words about losing weight, having more energy and feeling great. We know that the ‘diet world’ can be a jungle of contradictory ideas, conflicting opinions and cheap sales tricks, and we understand that many people who want to be healthy, end up frustrated and disillusioned and feeling cheated by the books, websites and ‘diets’ they look to for help. It is our goal that Mother Nature’s Diet is the answer to that mess. Please do visit this page and learn all about the 12 Core Principles. No gimmicks, just common sense. 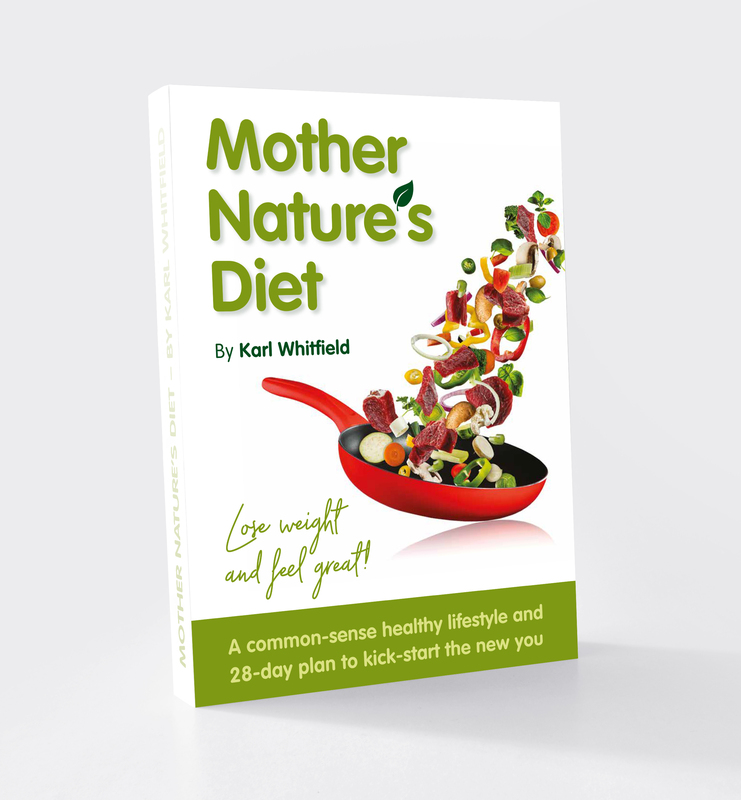 Mother Nature’s Diet was started by Karl Whitfield in 2011, borne out of a combination of his passion for healthy living, his own personal health transformation and his frustration with the endless confusion and complexity that pervades the worlds of weight loss, health and well being. Karl fought with excess weight for over 20 years, yo-yo dieting in and out of obesity for two decades. He smoked for 20 years, was a heavy drinker for 26 years and suffered nasal conditions and skin conditions that had him taking prescription medications for 17 years. Karl turned his poor health around, lost 101 pounds of fat (that’s 46 kilos, or 7 stone 3), quit smoking and drinking, cleaned up his life, came off his medications, cured his own health problems and became passionately obsessed with all things health and nutrition. He got fit, ran a dozen marathons, became a qualified Personal Trainer and read over 840 books and research papers on all aspects of health, disease prevention, nutrition, ageing and longevity. In all that reading, it was Karl’s frustration at the mass of seemingly-contradictory opinions on almost every aspect of health and fitness, that led him to develop the 12 Core Principles of Mother Nature’s Diet. Most of the blog entries on this site were written by Karl. If you feel so inclined, you can read about Karl’s personal health and life transformation here on his Karl’s Story page. Please visit our main site and get in touch, we would love to hear from you. To learn more about Mother Nature’s Diet please take a look around this website and read some of the blog posts here, visit our main site to learn about MND Life! our members-only community subscription and please check out our video blog site MND TV. If you have any questions about the Mother Nature’s Diet healthy lifestyle that have not been addressed on the 12 Core Principles page or the FAQs page then please use the ‘Leave a Reply’ box below here to ask your question publicly, or email us at contact@mndhealth.com and we will get back to you as quickly as possible. If you are interested in attending a life-changing seminar, workshop or retreat, please find details on the Live Events page on our main site. Stay in touch, post a comment, drop us a line, we welcome all constructive feedback, comments and questions. We hope that Mother Nature’s Diet proves to be of benefit to you. Stay healthy and let us know how you get on. Thanks and HELLLOOOOOOO to you in Austin TX!! GREAT to know the MND message is reaching you so far away! Stay healthy, stay happy!!! Hi, I just want to say I appreciate the effort you made to share your experience with other people. I live a life style similar to yours, let´s say I am at 80% of what you do … I began three months ago and results were incredible. I have to say I never gave thought to healthy living things before instead I followed the general conventions of society. Certain things are hard for me where I live (Argentina) because it is not easy to find organic products for example but in general it is possible to follow a healthy lifestyle. Cheers! Hey hey big “Hello” to you in Argentina!! I am really pleased to hear you are getting great results – well done, keep going!!! All you need to know is here on this site Vanessa, start living by the 12 Core Principles of Mother Nature’s Diet and you’ll soon see permanent results. Thank you for MND. I’ve only done 3 days and feel much better already. It’s very simple too. I thought I was already eating healthily but couldn’t lose any weight. The ‘no grains’ makes sense and is definitely making a difference. I only have to think protein – fish, meat, eggs, fruit and veg, nuts and seeds. I drink plenty of water now.There’s always plenty of food and I’m never hungry either. Thanks for letting me know how you are getting on!